The challenge facing the UK government is that the health and life expectancy of its population are not as good as in many other countries in Europe. The health of the public and the completeness of health services is now a responsibility of government in all European countries, but many aspects of health are beyond government capabilities. In the UK the government still remains under the impression that it should be able to fix all health problems, and this is thus the expectation of the public. When the NHS was introduced in the UK in 1948, Aneurin Bevan, its architect and first Minister of Health, stated that "even when a bed-pan is dropped it will be heard by the minister in Whitehall". This set the scene for an over-centralisation of responsibility which subsequent ministers have been trying to dismantle. However the people look to the government when things go wrong and when standards are not as high as expected. the living is very variable. It depends on local nomenclature and there are reporting variations from country to country. Take for example Modena in northern Italy. Modena is the home of Balsamic vinegar, Ferrari and Masserati cars, and a large derelict tobacco factory. It is a pleasant city like so many in Italy and it must be a delightful city in which to live. 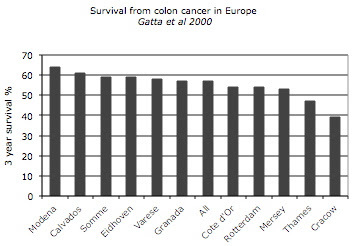 A European study shows that survival from colon cancer is highest in Modena. 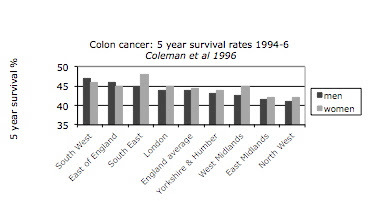 This was judged as the percentage of those diagnosed with colon (bowel) cancer who were still alive after three years, and it was 64% in Modena compared to 47% in London (Thames). The medical services in Modena take the credit for this achievement, but to paraphrase Voltaire, is this just doctors taking the credit while nature brings about the cure? Does Modena really have the outstanding medical services that lead to it having the lowest mortality from bowel cancer in Europe? Or is it because Modena is in Italy? And in Italy we can also see low death rates from heart attacks and other cancers compared to the UK. I do not believe that it is bad medicine in the UK that leads to poor health performance figures any more than I believe that Italy and other southern European countries have more excellent services. Voltaire was right! Nature is of the greatest importance, and within nature it is the sun that controls much of our health and death. We see a similar effect in the UK itself. Survival rates from colon cancer are better in the southern parts than in the north. Once again I believe that this is due to the superiority of the climate rather than the medical services. Here we see percentage surviving for five years. There is a lot of sun in Italy. Rome receives sunlight energy at ground level of 176W/m2, compared to 109 in London, and even lower at 94 W/m2 in Edinburgh. The only city recorded with lower sunlight energy is Anchorage, Alaska, at 79 W/m2. This is the key to the success of Italian health statistics. The UK government cannot control the sun. It is clear that medical efforts to mimic the results of Italy, at great cost, have not been successful. It is time to acknowledge the importance of climate - the sun - and perhaps to encourage exposure to the sun, UV light and vitamin D to try to improve the health and life expectancy of the British people. While we are on the subject of Italy, you might care to look at a couple of short movies that I prepared following a short trip to Modena to see if it looked different from anywhere else. The clear blue sky made it obvious that I was not at home in north-west England! The movies are from nearby Ravenna and Classe, famous for the wonderful mosaics created by the Visigoths in their capital city at the time.